FaciliWorks CMMS is a maintenance management software solution that enables facility managers to optimize maintenance workflows, save maintenance costs, maximize productivity and increase asset uptime. The product offers flexible deployment options on on-premises or cloud based servers, as well as offers both web-based and thick-client user interface depending on the needs of the end user. The solution also offers mobile version to access and modify workflows on the go. FaciliWorks offers a hierarchical navigation menu with tabbed data screens for speedy data entry, the product enables certain fields to be marked as required to avoid the entry of incomplete data. The maintenance job calendar feature of the product offers a drag & drop scheduler enabling the assignment of a specific date on which a staff member would complete a work-order or re-assign it to a pre-defined workflow to balance out excessive work-load. The product also offers asset records management with features such as capturing detailed asset information, tracking warranty & service contracts, date based or meter based work-order scheduling, asset cloning & grouping, and an optional calibration management module. 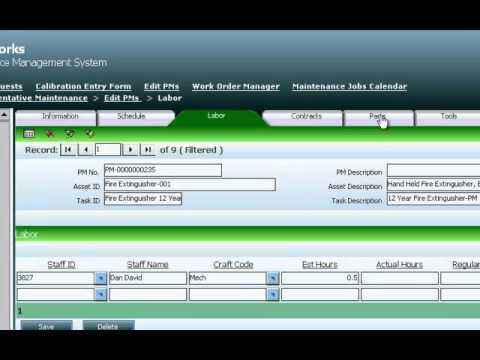 The solution also enables the management of scheduled & un-scheduled preventive maintenance management events including updating & tracking labor status, tools & spare parts management, eSigning of work-orders, email notifications for completed work orders, and the creation of multi-task work-orders. FaciliWorks offers compliance to several standard protocols including ISO 9001:2008, ISO/TS 16949, ISO 13485:2003, and FDA 21 CFR Part 11. The product caters to the needs of mid-sized and large enterprises including HP, Bosch, US Air Force, 3M, GE, AT&T, Johnson Control, and Nintendo, among others. Satisfying, ease of use, and great inventory compiler. I have already expressed those feelings in the survey I just submitted.Ability to write PO'S and tracking of those PO'S through every step of the process. Inventory control is reliable and the reports generated are a great help at the end of the year. Ability to write PO'S and tracking of those PO'S through every step of the process. Inventory control is reliable and the reports generated are a great help at the end of the year. After six years of usage and several calls to customer support, I still do not have the ability to use the tax block on my PO form, and if I attempt to, the entire PO becomes locked and I have to discard it and start a new one. I cannot batch print work orders, but have to open and print each one individually...I inquired about that one too. I have to change the billing address on my PO'S each time I write one-(the street address and PO Box cannot both be saved). When I go to the PO listing page the dates are never posted with the PO#. When I begin to write a PO and I am ready to go to the line items tab, I don't have to be told by a little box, to go to the line items tab and list my items...an ill contrived, time consuming step in the program which needs to be removed. Thank you for your FaciliWorks review, Richard. Your feedback is critical to ensuring future versions will meet the needs of our clients. I have created a case for you in our development system to alert our development team about those specific issues and allow us to address them in future builds. The wide range of format for the business. The ability to speak to someone in English when you need support. The program is very unstable most of the time. You are able to sign PM's without them being complete. Unable to get the inventory portion issues corrected by the support system in a timely manner. The log in feature does not put the curser in your name box. We had a Rep. come out for some hands on training when we first started using the program. He saw a lot of issues that we were having with the program and had no answers or solutions for us. We were told that he would report them and have someone get back to us. This never happened. We have had a pop-up that cannot be removed in the inventory portion for almost two months now. This issue has not been resolved in a timely manner. The log out tab was removed in the last update and you were to log out just by clicking on the red X at the top of the page. This only works about 15% of the time. And it shows you as being logged in twice if you re-sign into the program. Thank you for your FaciliWorks review, Clifford. We truly value your input. Please reply to this response so that I can get your concerns over to our Support manager and your cases escalated. Thank you. Easy to enter information when adding new assets, tasks and procedures. A lot of information can be kept in one software. Would be nice to have a software that can just manage internal preventive maintenance and not all the tools, parts, suppliers and contractors, etc. When changing or editing tasks the information does not automatically update in the procedures and assets. This all has to be done manually and takes a lot of time. Too many tabs for adding the same information. Also there is no option for selling an asset only options for inactive, scrap, lost etc. Thank you very much for the great feedback--your input is critical to improving our products. We are working on newer versions that will simplify your day-to-day operations and we will even have a version without out all of the excess items you mentioned ( PM's without all of the elements you do not require.) Also, you mentioned FaciliWorks having limited options for Status categories (such as sold assets). You can change or add more status values in your FaciliWorks Configuration|Asset Status. Thanks again for taking the time to share your experiences with our product. Faciliworks has helped me keep track of the task I need to keep the shop running. It would be helpful if there was some videos of the best way to start entering information into the program. It would be nice to have some reports to see an overall look at how well the maintenance program is working. For some reason the month of september does not keep record of cost. Thank you for your FaciliWorks review, Keith. Please tell me about your experience with our support team - we have made some changes recently and would like to ensure our efforts are providing the best level of support for you moving forward. Your product feedback is invaluable to our efforts and will help us make improvements to our upcoming versions. Software is fine but your service is worse . I always call for the support service asking for some modification or help for the setting, he said i need to purchase it, if i need an extra service call the sales for modification, the IT always said i need to contact our company IT, always suggest to pay more or purchase this or that, or request for training (pay again)I always eager to learn more on it by my self. but i need help from the expert creator of Faciliworks. I always eager to learn more on it by my self. but i need help from the expert creator of Faciliworks. Thank you for your feedback on FaciliWorks, Marilyn. Your comments help us identify areas in which we can improve our software and the user experience. Because FaciliWorks is highly customizable and configurable, we always recommend our onsite training services to make sure your get the best results out of the software and to ensure that it meets the specific needs of your company. Please contact us at any time or visit our website to get more information on the professional services we offer. We're confident that our services will resolve your issues. ●	FaciliWorks CMMS works on a range of deployment modes including web-based, hosting, on-premises or on the cloud, or installation on a windows based desktop, depending on the level of data control required by the end customer. ●	The product enables users to access critical workflows from their mobile devices including creating & editing work-orders, accessing preventive maintenance orders, and updating meter readings. ●	The suite offers intuitive & customizable dashboards for monitoring current system status and accessing commonly used reports. ●	The product offers extensive filtering capabilities with features such as advanced filtering on records and filtering through smart lists. ●	FaciliWorks helps in managing scheduled & un-scheduled work orders, as well as managing preventive maintenance events. Below are some frequently asked questions for FaciliWorks. Q. What type of pricing plans does FaciliWorks offer? Q. Who are the typical users of FaciliWorks? Q. What languages does FaciliWorks support? Q. Does FaciliWorks support mobile devices? Q. Does FaciliWorks offer an API? No, FaciliWorks does not have an API available. Q. What other apps does FaciliWorks integrate with? Q. What level of support does FaciliWorks offer? Q. Which apps is FaciliWorks compared to most often?